While most of the points they note on their blog post detailing this update seem positive (like making the star feature more better explained), the Disqus guys have once again left out a crucial feature: CSS support. As you probably expected (me too, actually), Disqus has yet to add CSS support for (now) their only embed solution for websites, considering that they destroyed the "classic Disqus" a few months back. One thing that still continues to irk me, as well as a fellow viewer on the site, is that the text color for the comment box is a dark gray color, instead of black like it used to be. 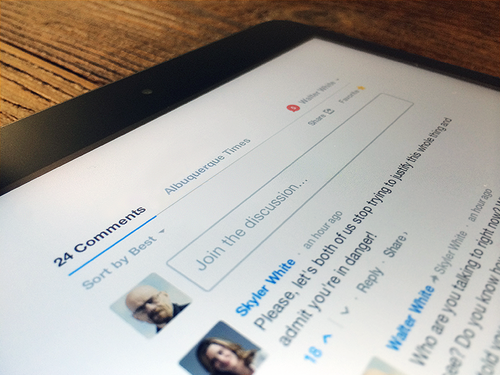 Older versions of the new Disqus used to have a comment box that was slightly transparent to blend into the background and would have black or white text as the color depending on the color theme selected. Now, it is white on both light and dark theme. To be honest, I shouldn't have to sit down and write CSS files for Stylish just so I an have a usable Disqus again. Another thing I forgot to mention that I'll just mention now is that Disqus is once again changing up the layout of the comments embed. I wish they'd give more warning about this kind of thing because I don't think switching up the theme of the comments occasionally without warning is not fair to users and site owners. Disqus likes to mix up session IDs somehow, which causes users to be logged into other user's accounts with their full permissions. Because Disqus forums can be deleted easily by primary moderators with no data recovery, this spells a big issue for site owners.